Featuring Danganronpa, Yokai Watch, Ushiro, and more. This week’s Famitsu has an 11-page feature on games industry rumors. You heard a little bit from the feature earlier this week, but now with the magazine out, we’re able to delve into all 40-something rumors addressed. Though, as Sal noted in our initial post, a lot of these aren’t actual rumors. In some cases, actually, Famitsu is taking straight-up facts and adding a question mark. 1. The September 2014 Japanese release for the Xbox One is set to include a large launch lineup, including worthwhile exclusive games. Few concrete details are available at this time, but Microsoft told Famitsu that it’s working hard to ensure Japanese players are satisfied with their purchase out of the gate. More specifics are said to be coming out on this topic towards the end of April. 2. An Xbox One model without TV-related functionality is being prepared for the Japanese launch. Microsoft was also questioned on the matter, but essentially gave the same answer as before; they’re busy preparing for the Japanese launch and will have more to discuss at the end of this month. They do mention, however, using their words, that they want to launch the system in the “most suitable form” for Japanese consumers, leading Famitsu to believe that a version without the TV features that Microsoft has been touting could potentially be in the cards. 3. The game world in Metal Gear Solid V: The Phantom Pain is set to be 200 times larger than that of Ground Zeroes. Konami outright confirmed this to Famitsu, stating that the number is actually set to be over 200 times larger and will have players traversing a wide variety of environments under different climate conditions, with time passing during the game all the while. 4. Part of Kojima’s direction in Ground Zeroes was inspired in part by an AKB48 music video. Konami also confirmed this, pointing out that the sideways lens flares that can be seen in the game are directly inspired by the idol group’s music videos. 5. Sony Computer Entertainment and From Software are developing a new game together. 6. Dead Nation: Apocalypse Edition is making its way to Japanese Ps4s. Sony’s Japanese branch commented on this issue as well, stating that they’re investigating the possibility of releasing games that their western counterparts have already published. Famitsu ends up therefore concluding that it’s probably the game is going to make it over there. 7. The Last Guardian is actually going to come out. If you’ve been following game news for a while now, you’re probably aware of the highly tumultuous development cycle that’s hit Team Ico’s follow-up to 2005’s Shadow of the Colossus on the PS2. When Famitsu asked Sony about this game, the magazine was told that Sony is still waiting for a good time to reintroduce the game. However, they also said that new information and even a release date could be announced soon should development go smoothly. 8. Good things will come to those who clear Ground Zeroes before playing The Phantom Pain. Yet another Metal Gear rumor that Konami outright stated is true. Players who load a Ground Zeroes save file into The Phantom Pain will find POW characters that they rescued in the former appearing on Mother Base in the latter in addition to other unique characters as well. They also stated that there will be other perks for loading your save data, but were mum on the specifics. 9. The guard dogs that appear in Ground Zeroes‘ opening were motion captured. Konami stated that this was also the case, saying that real dogs were in fact utilized in order to heighten the game’s level of realism. 10. A new Metal Gear Online is being produced at Kojima Productions’ Los Angeles branch. Have you spotted a pattern with these Metal Gear rumors yet? This one is also true, with Konami stating that the Los Angeles and Tokyo branches are working in tandem to make this happen. More information is set to be revealed on this at a later date. 11. The HD re-release of Final Fantasy X has resulted in Square-Enix jump-starting development on X-3. Kazushige Nojima and Yoshinori Kitase chimed in on this matter, essentially saying it’s not happening, at least not yet. Nojima reminded people that he put out both an audio drama that came with the HD re-release and another separate novel altogether that continue the plotline of that universe. Kitase, meanwhile, said that no game of the sort is in production, although he recalls some work was once done while talks were happening on it when Nojima still worked for Square. That being said, Kitase expressed an interest in working with Nojima again one day and Nojima likewise stated that the world of X could see new developments one day if fans’ demands are loud enough. Knowing that, Famitsu believes that while X-3 isn’t in development, they wouldn’t be surprised to hear that perhaps the HD remasters for X and X-2 rekindled an interest at Square-Enix to revisit the universe beyond the new material already published. 12. A new Dissidia: Final Fantasy game is in the works. There are no tangible announcements to be found, but both Ichiro Hazama and Mitsunori Takahashi have gone on record expressing a strong desire to develop such a game. Famitsu takes this to mean that Square-Enix is at least keen on it and that if it were to happen, characters from Final Fantasy XIV and XV would join the fray for the next go. 13. Final Fantasy Agito‘s release is coming up. Square-Enix’s Tabata Hajime commented that they’re working to put it out in time for the Japanese rainy season and that players will be able to pre-register for the game prior to release. 14. Bravely Second‘s scenario writing is complete. Tomoya Asana replied to Famitsu’s request for comment by saying that plans are ramping up for the Bravely Default sequel and that details about the game could come out this summer. 15. More Kingdom Hearts information is coming soon. Shinji Hashimoto stated that production on Kingdom Hears HD 2.5 Remix and III is occurring simultaneously. Since work has been completed on compiling new scenes for the former, he says that more information related to the series should be announced in the near future. 16. Developing is coming along smoothly on Final Fantasy XV. Hashimoto again fielded this rumor, stating that although the timing isn’t yet fixed, they want to make sure what they bring out lives up to people’s expectations, and are preparing new information for release. 17. A major monster is set to be coming to Dragon Quest Monsters 2. Although Square-Enix has already been letting Japanese players get their hands on new monsters by acquiring them Pokemon-style from specific electronic stores that are distributing them wirelessly, Famitsu notes that one monster in particular is conspicuously absent. Square-Enix’s PR team got back to them saying that they just might in fact make that happen and to wait for more information. 18. Final Fantasy XIV players will finally get their own rooms in Free Company housing soon. Square-Enix’s marketing team confirmed that this will also be the case. Housing is said to consist of apartments with no gardens for one type and another type that comes with a garden, with preparations for the latter currently being underway. One of the types is said to be arriving with the next patch, 2.3. 19. Another song was added to Theatrhythm Final Fantasy: Curtain Call because of a mistake a producer made. Another confirmation for this one. Square-Enix’s marketing team answered that when producer Ichiro Hazama appeared on a Final Fantasy XIV livestream, he said that game would have nine songs in Curtain Call when the original plan was eight. As a result, a song that was originally planned to be DLC was promoted to be included on the actual cartridge. From what Famitsu gathers, this was a stressful addition for the development team for the make considering that they were already running out of space on the cartridge, but it’s happening nonetheless. 20. Gunslinger Stratos 2 has pro gamers emerging for it. With Square-Enix’s dual-wielding arcade game proving to be a hit around the country, large numbers of players are competing to prove their superiority and are in turn apparently cultivating a potential professional scene. When asked about the matter, Square-Enix’s Nobuki Kadoi believed that the possibility is there, especially since the company is hosting official tournaments of its own for the game. 21. Compile Heart has started work on the second Galapagos RPG and it’ll have something to do with emoticons. Compile Heart didn’t beat around the bush on this matter, stating that another Galapagos game is indeed. 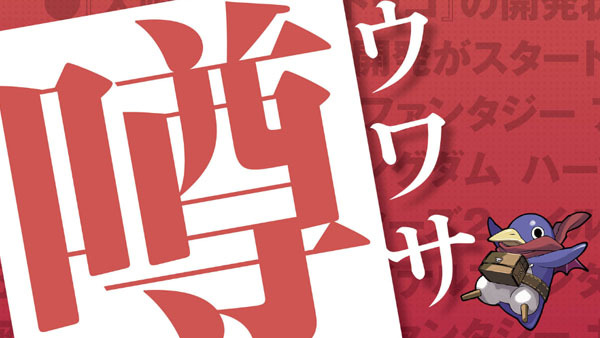 Compile Heart general producer Norihiki Kochiwa said that development is already underway and Kenta Sugano, the new game’s director, went so far as to show Famitsu the development document that they had just finished drafting up. Kochiwa also drew a Japanese-style emoticon on a piece of notebook paper as a hint regarding the game’s theme and said that the company should have more to share about the game soon. 22. A Gundam game is in development to commemorate the franchise’s 35th anniversary. This year is a big year for Gundam, having gone on 35 years at this point. At this stage, the one major thing known to be in production to commemorate the occasion is a new anime series helmed by series creator Yoshiyuki Tomino, Gundam Reconguista in G. When Bandai Namco was asked whether it had any games in the works as well, the marketing team commented that they’re planning Gundam games for various platforms, including the upcoming Mobile Suit Gundam Side Stories. 23. 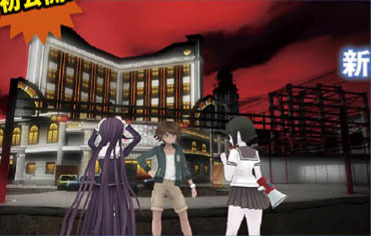 Characters from previous Danganronpa games will appear in Zettai Zetsubou Shoujo: Danganronpa: Another Episode. 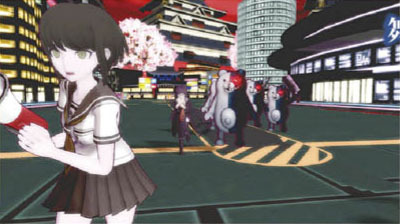 When scenario writer Kazutaka Kodaka was asked to comment, he said that’s remaining mum about whether anybody else beyond Komaru Naegi, the younger sister of the first game’s protagonist, and Toko Fukawa would show up in the upcoming Vita action game spin-off for Danganronpa. He did, however, forward them a new screenshot that shows an altogether new boy joining the fray in an unknown capacity. Famitsu was additionally told that the scenario was complete and while a release date hasn’t been announced yet, “good news” is set to arrive in the coming days. The magazine also has two new screenshots of Another Episode. 24. Koutarou Uchikoshi is working on a new game at Mages. Although he’s still working for Spike Chunsoft, Uchikoshi unambiguously told Famitsu that he is indeed collaborating with Steins;Gate developer Mages on a new game and that the scenario is already complete. He went on to say it’ll be a “sexual comedy” set to a science fiction suspense fantasy. As one might expect from him, he has high hopes that the game will turn out well. 25. Mages is remaking one of its adventure games. While checking things out regarding their get-together with Uchikoshi, Famitsu also inquired about whether it was true the company was remaking one of its previous games. Marketing director Akiyoshi Yamazaki confirmed as much, although he refrained from specifying which game is getting that treatment. A proper announcement is set to come from the company soon. 26. A new Shining game is going to be announced soon. When asked to comment, series producer Tsuyoshi Sawada said that 2014 is going to be a big year for new, experimental things in the Shining series, including the previously announced arcade fighter Blade Arcus from Shining. Beyond that, he hopes to continue the series on a variety of a platforms, including home consoles. Famitsu believes that this means more announcements about the future of the Shining series could be made at this year’s Tokyo Game Show. 27. Nippon Ichi Software is developing an exclusive game for PlayStation 4. NIS president Nikawa confirmed to Famitsu that a PlayStation 4-only game from the developer is indeed coming. As is tradition, the plan is to send out more information on the game through their yearly summer greeting cards. 28. Old faces from The Guided Fate Paradox will be appearing in the upcoming The Guided Fate Cross Thesis. Famitsu got another straight answer from NIS on this matter, hearing that five of the angels from the first game—Liliel, Kuroiel, Lanael, Cheriel, and Neliel—are set join the cast once again for The Guided Fate Cross Thesis. The voice actors appearing in the game are also said to be worth keeping an eye on. 29. The third game in NIS’s “New Brand” series (which includes htoL#NiQ: Hotaru no Nikki and If You Thought It Was Harem Paradise It Was Yandere Hell) line is going to have a more adult tone. President Nikawa once again gave Famitsu a confirmation, saying that the next game to come after htoL#NiQ will have a bit of a sexual flair to it. Famitsu remarks that such a description reminds them of the company’s Criminal Girls, but since “New Brand” is being used for new IP, they don’t think this new game is a continuation off of that. 30. A surprise is planned for the Monster Hunter 10th anniversary event. Capcom is planning to throw a commemorative event to celebrate ten years of Monster Hunter on April 21. When Famitsu asked whether the company will bring anything special to it, series producer Ryozo Tsujimoto implied that they might have some new things to talk about for the upcoming Monster Hunter 4G. 31. Shu Takumi’s new Ace Attorney game will shake the series up. In February’s Nintendo Direct, it was announced that Capcom is producing another entry in the Ace Attorney series that will once again be helmed by series creator Shu Takumi. Famitsu attempted to follow up with Capcom for more specifics about how Takumi is setting out to refresh the series with this new game, but a PR member for the developer simply said that they have more announcements on the game in the horizon. The magazine takes this to mean we might hear more about the game soon. 32. Nintendo will officially announce a new Legend of Zelda game for the Wii U at this year’s E3. Famitsu didn’t ascertain a response from Nintendo on this matter, instead opting to state timing such a release for the industry event wouldn’t be out of the ordinary. 33. Level-5 is developing a sequel to Yokai Watch. 34. Level-5 is reviving the once-cancelled Ushiro. Ushiro was once a PSP RPG that Level-5 announced in 2009 that never ended up coming out. When asked about its prospects, Hino went on record saying that the company is mulling over new developments for it and hopes to have something to say about it in the future. While not a definitive answers one way or the other, Famitsu remains hopeful that horror fans will have good news to read about the game eventually. 35. Senran Kagura has more fruit to bare beyond the previously known three new games coming up. 36. Various game worlds are coming to life this summer in Nagasaki. Nagasaki prefecture is home to Huis Ten Bosch, a major Japanese amusement park. Famitsu caught wind that the theme park is planning to run an attraction dubbed “The Game Kingdom,” which will feature a number of famous games. The park’s planning director Ikki Nakahira said that it was true, adding that it will feature games both new and old and include fixtures such as a museum, a dinosaur-themed forest, an “amusement casino,” and a “survival game attraction,” among other things. The amusement park is said to be collaborating with a number of game companies and that it’s also planning to put on a large-scale convention and various other events. 37. A new Metal Max game is in the works. This is more Famitsu asking when we’ll see an update on Persona 5 than it is a rumor, but Atlus said it will share an update on the game at a later time. 39. The protagonist of the next Assassin’s Creed is a assassin in black!? A black-clothed assassin has become a recent topic of discussion on the internet. Some fans are wondering if this is the protagonist of the latest Assassin’s Creed. According to Ubisoft, as far as this matter goes, you fortunately might be able to guess. In other news, Famitsu hasn’t seen the trailer or leaked gameplay screenshots for Assassin’s Creed: Unity. 40. A new Fleet Girl coming to Kantai Collection is meant to evoke the feeling of springtime. 41. A pro wrestler’s hairstyle was influenced by a Final Fantasy monster. In a recent issue of ProWres Weekly, New Japan Pro Wrestler Hiroshi Tanahashi said that he was letting his hair grow out in the back as an homage to a Final Fantasy monster. When Famitsu pressed him for specifics in a mini-interview, he eventually came out and said it was Ifrit specifically he’s been trying to evoke, although he’s aware that his design has changed across games on the hair front.